Chefs are a hard working bunch. Long hours in a hot, challenging environment working with ever-changing variables including food supplies and finicky diners – these are people who really deserve their downtime. So what do four of Ottawa’s top up-and-coming chefs (and their culinary partners in crime) do every few weeks on their day off? They cook up a storm for charity, naturally. 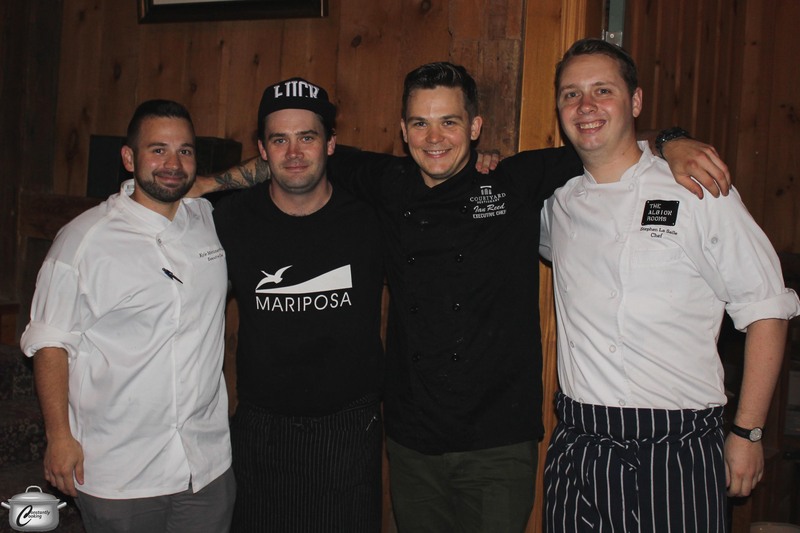 Kyle Mortimer-Proulx, Danny Mongeon, Ian Reed and Stephen LaSalle served up ten delicious courses at the Flux 3 dinner, held at The Grange Winery in Prince Edward County. The Flux series of dinners was conceived by Hooch Bourbon House’s Danny Mongeon, with the support of Ian Reed (Courtyard Restaurant), Stephen LaSalle (The Albion Rooms), Kyle Mortimer-Proulx (Lowertown Brewery) and Hooch’s Adam Bannerman, along with expert supporting talent. Billed as ‘food inspired by nature’, the dinners are a tribute to the field-to-fork philosophy that celebrates the hard working farmers who give chefs and home cooks alike such excellent raw materials to play with. 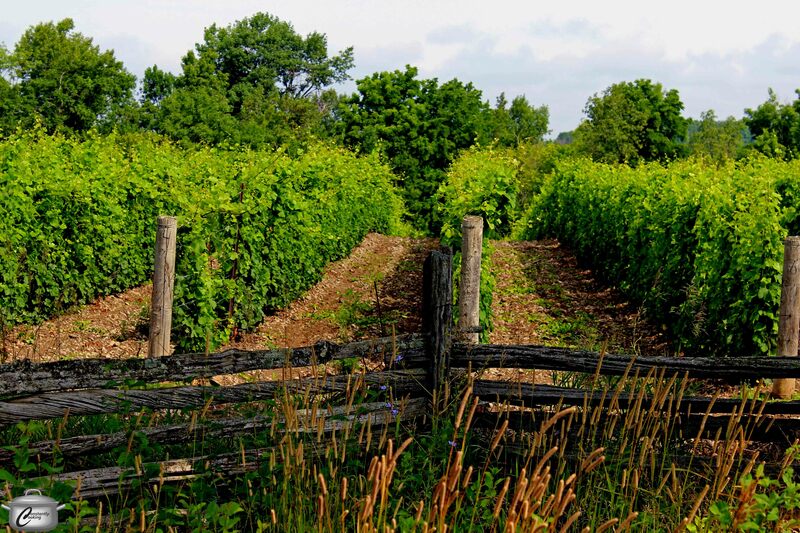 Caroline Granger has transformed her family’s farm into one Prince Edward County’s most successful wineries. The Grange was the perfect setting for this field-to-fork dinner. 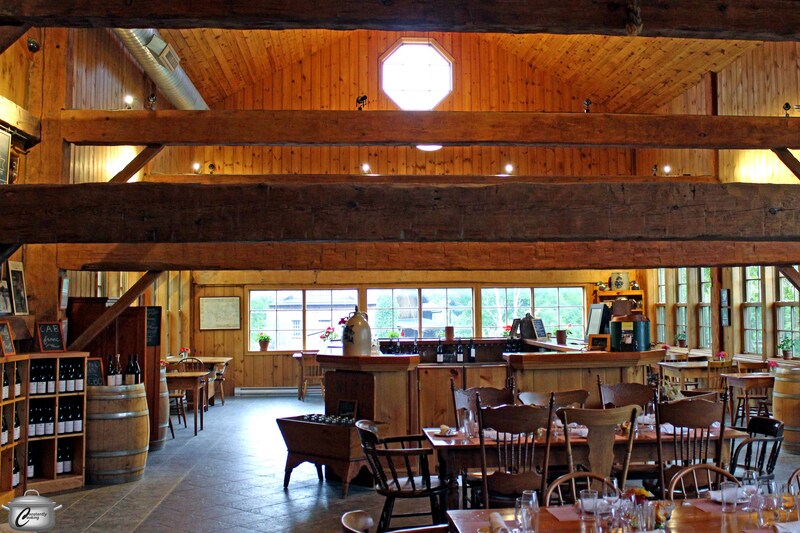 After Flux 1 at Mariposa Farms in June and Flux 2 at Rideau Pines Farm in July, it was with great excitement that the Flux team went on a road trip to Prince Edward County this past weekend, landing on August 4, 2014 at The Grange of Prince Edward Vineyards and Estate Winery. It was fun to see some of the chefs relaxing on the Grange’s beautiful terrace before service commenced. Owner and winemaker Caroline Granger, who has spent over a decade transforming her family’s farm into one of The County’s most respected wineries, welcomed almost two dozen diners to her gorgeous early-1800s barn for a ten course extravaganza that featured not only exquisite cuisine inspired by the region but also perfectly-paired selections from her winery. Just like the food served at Flux, all her products are field-to-table, made with grapes grown on her extensive property. 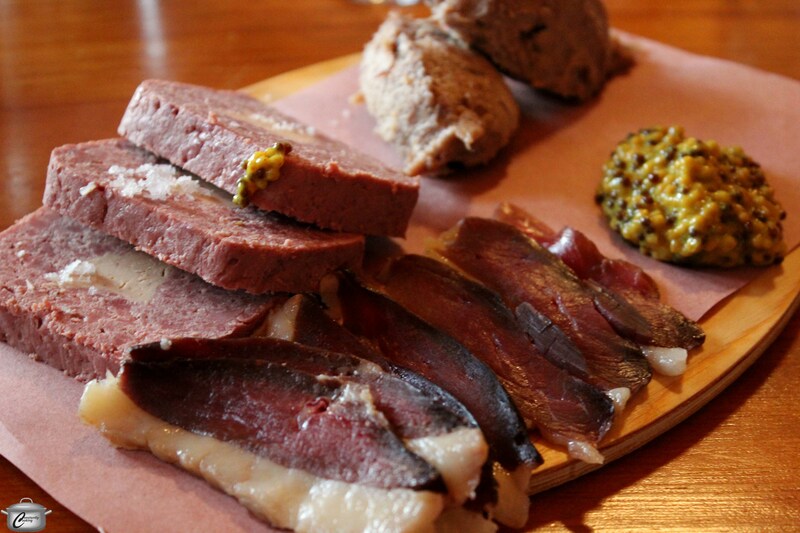 The meal began with a beautiful charcuterie platter prepared by Danny Mongeon, consisting of duck terrine with foie gras, duck proscuitto and duck rillettes, along with homemade mustard. This course was paired with a lovely Fume Blanc from The Grange Winery. The Flux dinners offer participating chefs a unique opportunity to interpret ingredients in ways that may deviate somewhat from the culinary style typically served at their restaurants. As a result, diners at these special events are the lucky recipients of inventive, creative approaches to the freshest of locally-sourced foods. At this week’s event, a succession of exquisitely-composed, beautifully-plated dishes elicited rave reviews from those in attendance. Having each chef explain his creation, followed by a message from Caroline about why she chose the corresponding wine, enhanced the spirit and enjoyment of the evening. 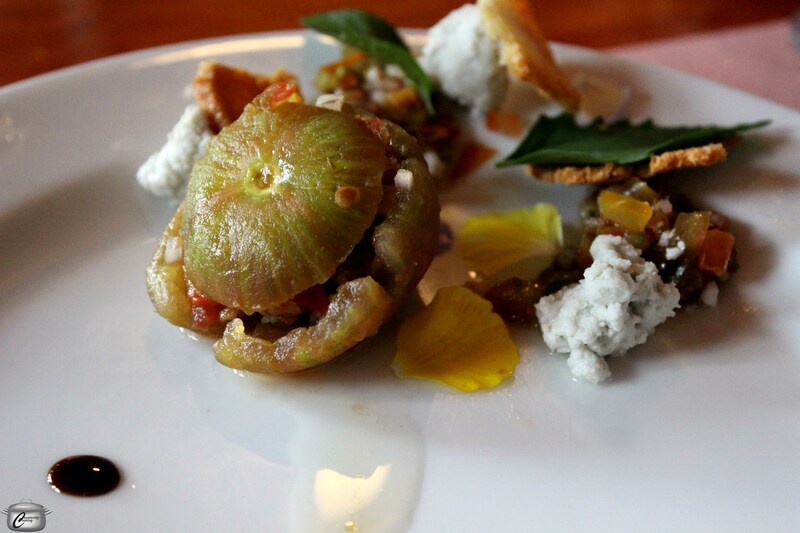 Danny Mongeon served up heirloom tomatoes stuffed with tomato tartare and served with mint, lambs’ quarters, brioche crisps and a queso fresco. The wine pairing was a lovely 2009 Gamay Noir which balanced perfectly with the acidity of the tomatoes. Each Flux dinner also has a charitable component; in this case, funds were raised to support the important work of Slow Food The County, a vibrant organization that both celebrates and advocates for sustainable, local food. 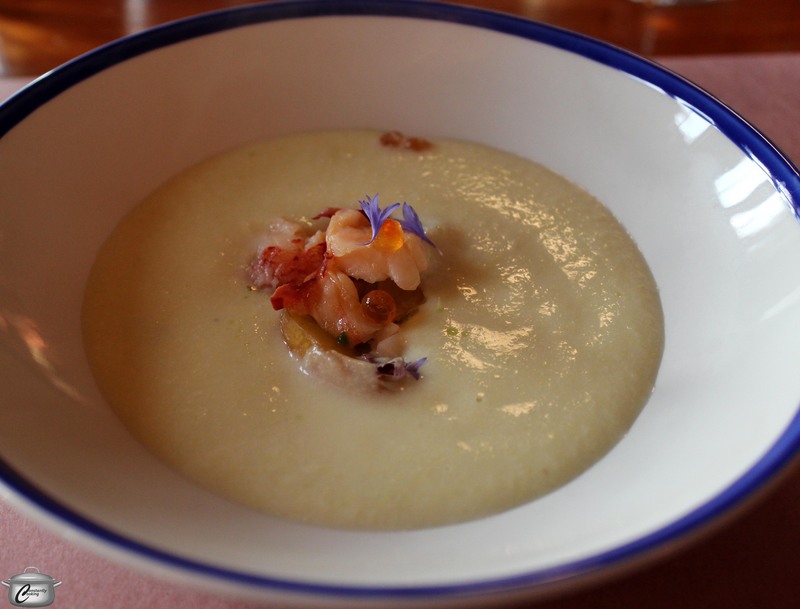 Kyle Mortimer-Proulx served up a beautiful and delicious corn bisque featuring charred corn, butter-poached lobster, salmon roe, cornflower petals and jalapeno oil. A 2009 Select Chardonnay with rich, sweet-smoky notes was the perfect pairing. 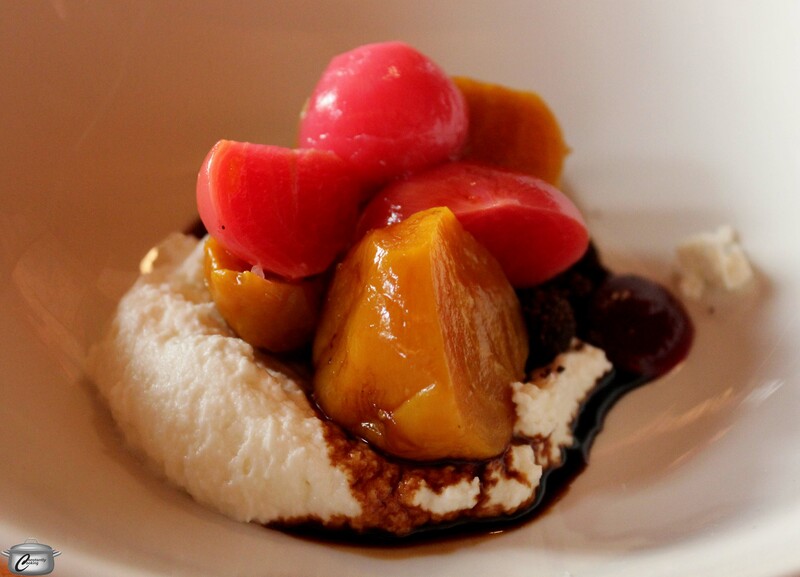 Ian Reed offered up Beet Salad three ways, including pickled chioggias, roasted golden and red beet puree, nestled on coffee-juniper ‘soil’ with whipped C’est Bon chevre and aged balsamic. The wine pairing was Trumpour’s Mill 2009 Pinot Noir. 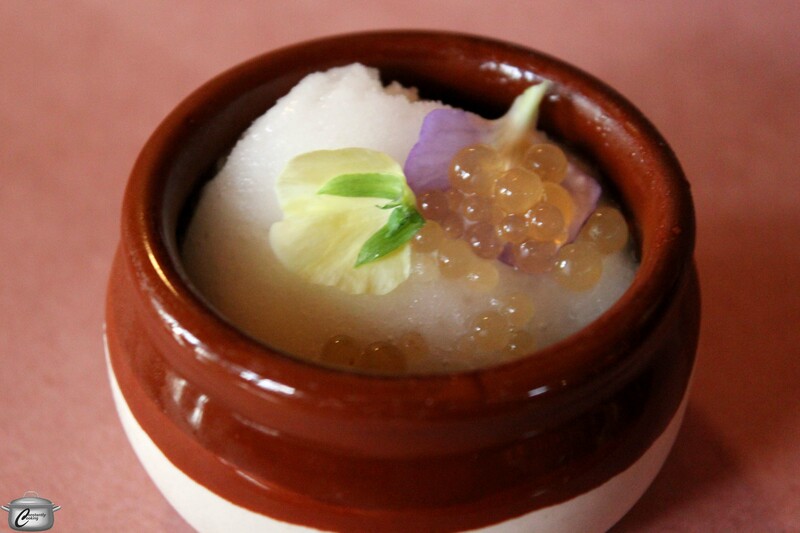 The palate cleanser was a fabulous Riesling sorbet prepared by Adam Bannerman featuring pickled apple pearls and viola blossoms. It was served with a 2013 Sparkling Late Harvest Riesling. 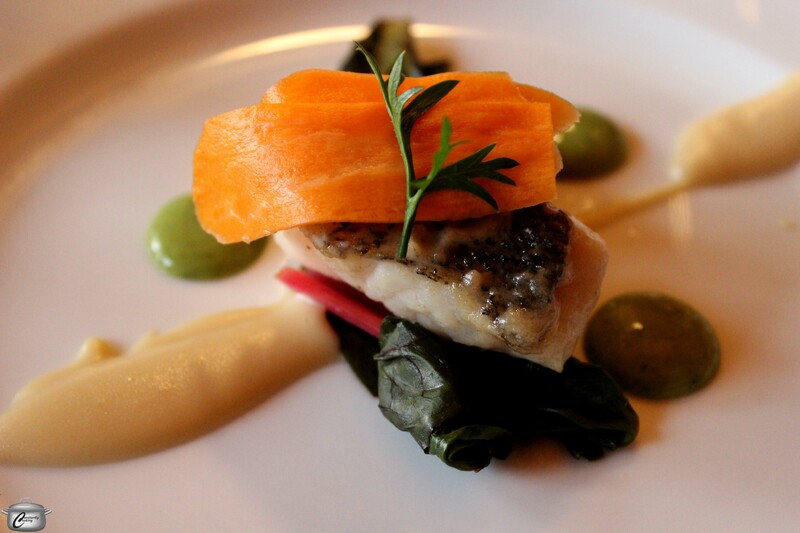 Adam Bannerman’s tasty Lake Ontario pickerel was served with smoked garlic puree, Swiss chard, pickled carrots and a tasty green goddess puree. A 2009 Pinot Gris with a lovely peachiness was a delightful pairing. 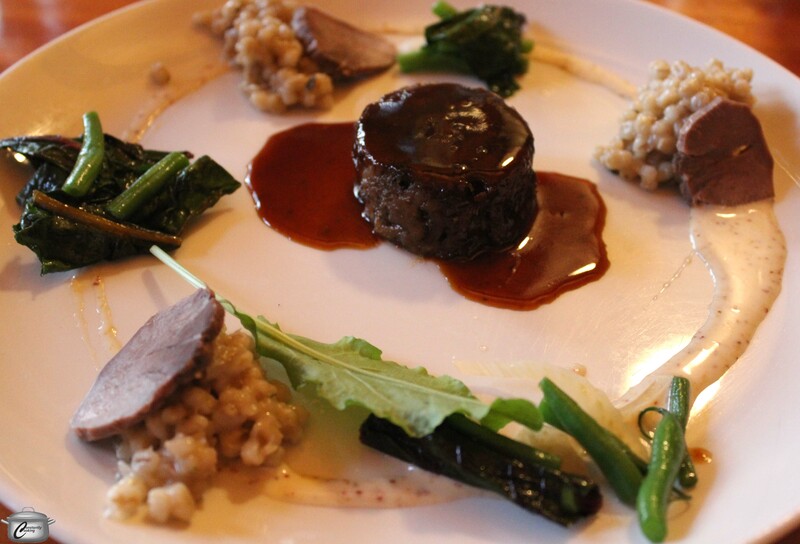 Stephen LaSalle’s playful ‘Tongue in Cheek’ course included pigs’ cheeks braised in Barley Days beer, a pearled barley risotto (a tribute to The County’s history) cooked in guanciale stock, pigs’ tongue plus locally-sourced sorrel and green beans. This was served with a 2009 Estate Cabernet Franc. 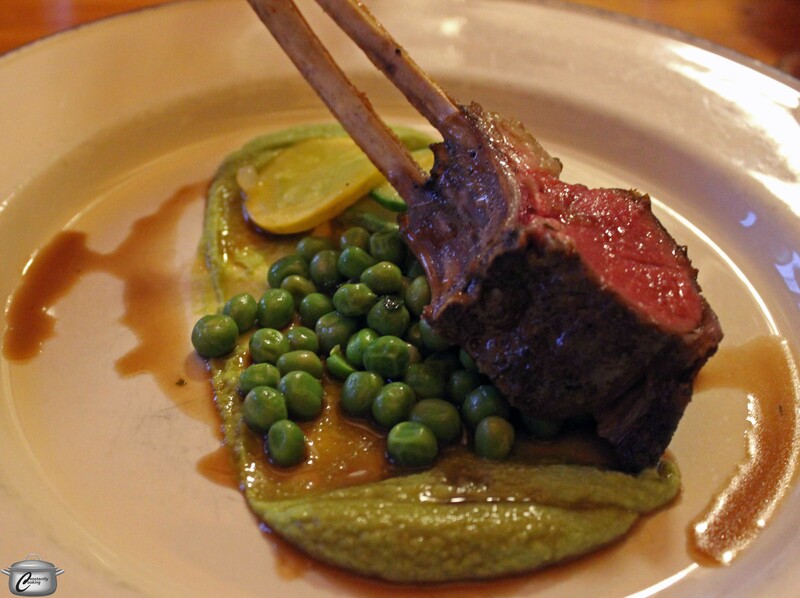 Kyle Mortimer-Proulx served up an outstanding plate featuring Ontario Lamb, PEC peas in two forms (sauteed with mint and pureed with chardonnay) along with sauteed courgette, tomatoes and onions. The 2009 Pinot Noir was a beautiful pairing with the tender, flavourful lamb. You have to love a meal where there is a pre-dessert sweet course! 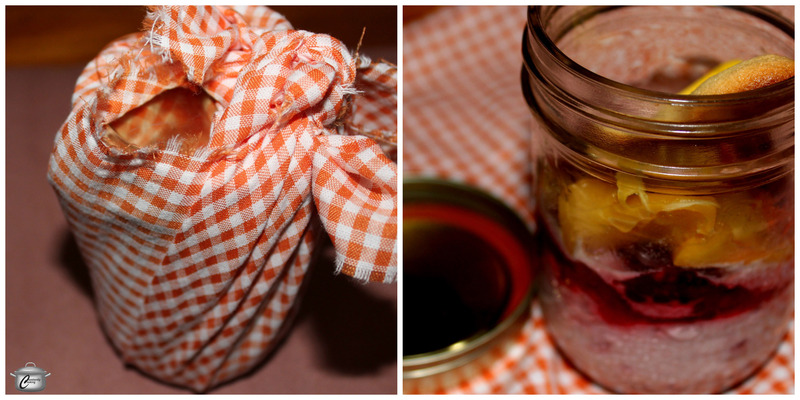 Stephen LaSalle served up cutely-wrapped raspberry fool in mason jars, featuring macerated raspberries, whipped cream with vanilla, peaches and sponge cake. A 2010 Brut was a delicious accompaniment. 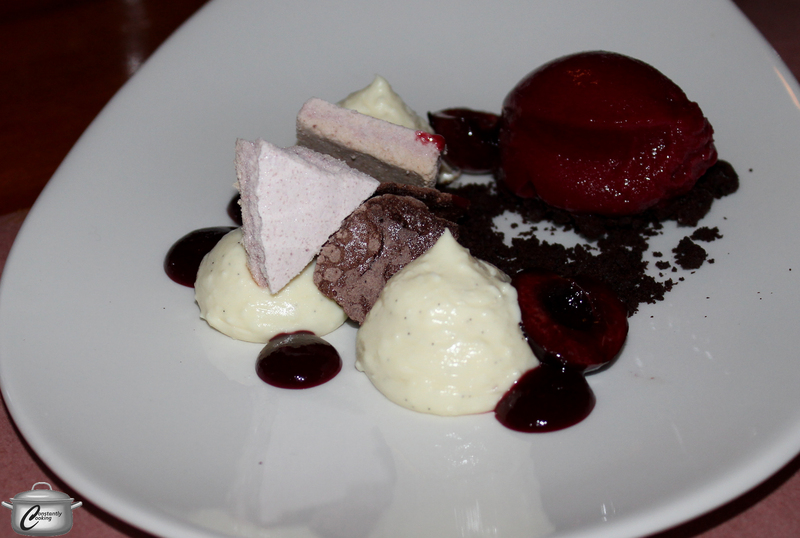 Ian Reed’s inventive spin on Black Forest Cheesecake included sous-vide mascarpone and lemon, dehydrated chocolate mousse, cherry gel, cherry sorbet and dehydrated cherry-chocolate crumble. A tasty 2010 Spiced Pinot Noir was an unexpected yet delicious pairing. When we finally strolled out of The Grange, fully sated after a night of convivial feasting, it was an added bonus to see a shrouded moon and hear howling coyotes off in the distance. Prince Edward County is a magical place well worth visiting and all the more so when some of Ottawa’s finest chefs put on a delicious show. 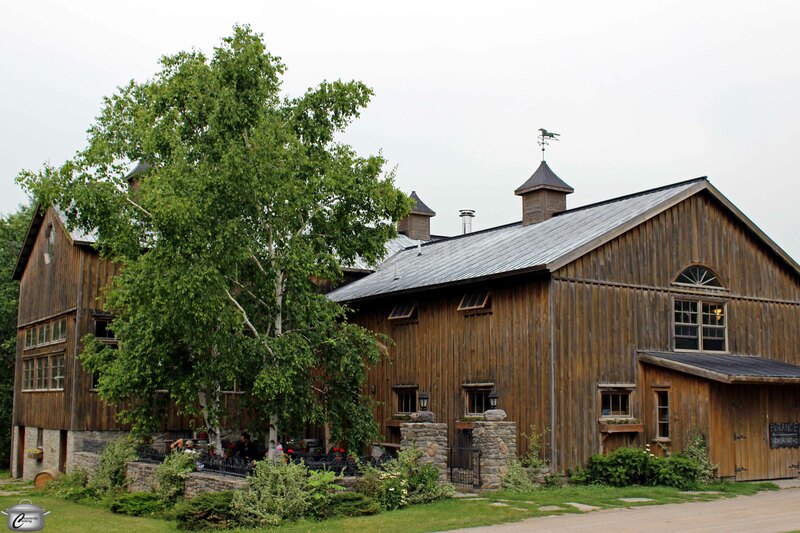 The Grange’s beautiful almost-200 year old barn is an incredible setting for wine tastings and other events. Gazing out over The Grange’s vineyard added to the ambiance of this Flux dinner. The next Flux dinner will be held in late September; stay tuned to Facebook and Twitter for details! You won’t want to miss it. This entry was posted in Events and tagged Caroline Granger, Danny Mongeon, dinner, FLUX, Flux 3, fundraising, Hooch Bourbon House, Ian Reed, Kyle Mortimer-Proulx, Lowertown Brewery, PEC, Prince Edward County, Slow Food the County, Stephen LaSalle, The Albion Rooms, The Courtyard Restaurant, The Grange of Prince Edward Vineyard and Winery. Bookmark the permalink.